The RoboBrrd Dashboard v2.0 app is a great way to control your RoboBrrd. The most important task that it can help you with is setting the home, min, and max positions of the servos. When the positions are written to your RoboBrrd's eeprom memory, it will be able to access those positions each time it starts up. Not to mention that you can also observe the sensor readings on the dashboard, and use sliders to mix the eye LEDs. The action buttons can give you quick access to common movements. Well, what are you waiting for? See it in action and download it, then check out the usage instructions! 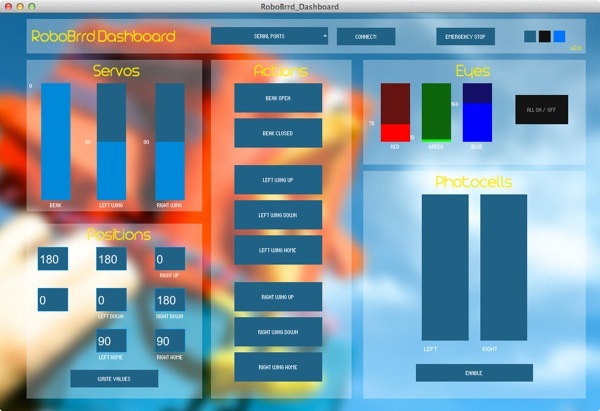 See RoboBrrd Dashboard in action (the original Beta 1 version), watch on YouTube. For detailed usage instructions, please visit the calibration page. RoboBrrd Dashboard was written in Processing. If you are interested, you can check out the source code for it over on Github!